I had a hard time finding my pet in our 30 acres, this systems gives me the security of knowing my pet is safe. Perfect system for my Pit. My pit and I just relocated and are lucky to have gained a lot more land for him to run on. I noticed that he liked to explore his new area but was uncomfortable with the thought of him leaving me forever or getting lost. Happy I purchased this package and will be able to keep him near but still have plenty of room. This system is good for up to 100 acres I believe, but I only have 25 so it offers plenty of coverage. I hired a small crew through a local labor finder and had my system installed in less then 8 hours and was training my dog that day. He seems to understand exactly what he is supposed to do and not to around those flags. Anyways great system and great quality of product and customer service. Service I can smile to! The best in ground fence system is the SportDOG system. The upgrade is worth the extra money. I've spoken with lots of people, asking for opinions on the in ground fence systems that are out there, and what their experiences were. My friend Mike, told me about the company Flexpetz, which sells these type of fence systems online. I looked at their website, and was very pleased at how easy it is to navigate and locate the items you are looking for. I selected the Pro Grade version of the SportDOG fence (it also comes in a regular factory package). I liked the fact that the Pro Grade comes with much better wire, and will allow me to send the transmitter and collar back, in exchange for something with stronger corrections, if it's needed within the first year. The fence was easy enough to setup. It took a few weekend hours to cover an acre. After it was setup, I used the test tool to walk the perimeter and make sure the collar is functioning properly. No issues. The collar runs on a 9 volt battery, so I don't have to get online or go hunting down a proprietary replacement when it runs low. All in all, the SportDOG Pro Grade fence is a very good, robust dog fence system. I am very happy with the system and look forward to many many years of solid performance. Thanks to Flexpetz and everyone who played a part in my decision and purchase. We purchased this system awhile ago for our property in Georgia. We like to take our dogs hunting with us and also love that they can roam freely around our property, knowing that they wont try to leave. They tend to be kind of curious but this system works on keeping them around. We love the outdoors and like to get away to stress free getaways. Knowing that I wont have to go find a dog in the next area code is helpful. The dogs have fun, we take it easy and all of us win. Thanks to the support we received from FlexPetz's customer service. They were able to walk us through how to "tweak" our system to our needs. This Pro-Grade package was definitely worth the extra money for the added benefits... So worth it. When I started looking at different fence options, I was doing a Google search for different manufacturers and models, when I ran across the Pro Grade SportDOG fence, that Flexpetz.com sells. I've worked briefly with SportDOG's training systems and liked their product at that time. Needless to say, when we saw SportDOG made a fence system too -I had to give it a look see. I spoke to Davin, at Flexpetz, and he was very helpful in telling us all about the features of the fence. We told him about our landscape and he told us about the things we need to be wary of with this type of fence system. I placed my order without hesitation. The system arrived at my home within 3 days and the fence was setup this past weekend. I'm really happy with the fence, but more happy with the help that I got from Davin and Flexpetz. I would recommend this fence to anyone. The SportDOG fence in pro grade is a fantastic system, especially when paired with the barriers for indoors. The SportDOG professional grade fence came up in a Google search. I'd seen the non-pro grade version at a few different websites. However, Flexpetz is the only company I saw that had this pro grade package. This is the upgraded version of the fence and came with much stronger wire, longer warranty, and some other nice features that the factory fence does not have. I thought that would be the better deal, because it will last longer without the need to repair or replace any wire. Also, I know someone who's purchased from Flexpetz before, and they were very happy with the level of service they were presented with. We also decided to get some of the indoor barriers, which work nicely with the same collars that come with the SportDOG fence. The whole setup works perfectly, and we're very happy with it. We also are very appreciative to Flexpetz.com for the help and courteous words they had to share with us. We rate our experience an A+. I called just a few minutes ago to get some support on installation of my fence. I am impressed with the service provided and would recommend anyone having any questions to go ahead and ask for Johnny. I am sure all the other staff is probably just as great, but Johnny has one heck of a personality and made my experience pretty amusing and fun. This system was not all that difficult to install it was just the main start I was having a blond moment with. Still, very easy. I was able to install this fence in approximately 3 hours total. Now I am off to train my hyper Golden Retriever. I just wanted to throw a good one up as a good reference! Flexpetz is really top grade when it comes to the wire driven shock fence systems. Daven was the rep I spoke to, in some length, about what the best system would be. He really was helpful and able to help me land on the Sportdog Pro Brand fence, with enough wire to cover all 6 acres. I didn't do the installation above ground, so I didn't need the staples that come with the system. I did use the splice kits to connect the paired wire to the perimeter wire. I also thought that running the wire through some garden hose (under a gravel driveway) would help protect it. A trencher took care of the wire work for me. Piece of cake. I would recommend using Flexpetz' staff to help you pick the best fence for you, but if you end up on the Sportdog Pro Brand, you'll be doing pretty good. I would grade this Sportdog pro fence as a very high thumb up. I am not the kind of customers who does reviews every day. 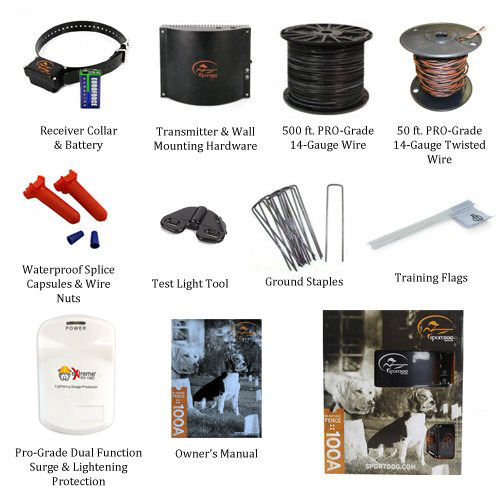 I did want to throw my two cents in on the Sportdog pro fence package that is sold here on Flexpetz. My idea of man's best friend happens to be a nice akita. She's beautiful, but a big girl. The Sportdog fence is a stronger fence than the regular PetSafe in-ground system. That is the first one I looked at. I do know about PetSafe products, a bit, but the Flexpetz staff told me that the Sportdog is actually a PetSafe product. We discussed the benefits of going with the Sportdog fence pro package, over the fence I originally wanted. I'm glad I had their expertise to lead me into the right direction. I am now very happy with my investment and found that it is quite an easy installation to complete. I am considering an indoor barrier now, as I was told that they work with the same collar as the Sportdog system comes with. I'm very happy and going to remain a Flexpetz customer. Best fence for a mix of dog breeds. From small to large, all are covered. I really chose this fence because of the ability to add all the different Petsafe collars to the fence, and all of them be automatically compatible. There is a collar for the dachshund, and one for the dane. All have their own correction levels and no special configuring necessary to get them recognized. I think I can get another of the transmitters and setup a fence zone down at the lake house, and the same collars will work on that system too. I'll have to call the petflex guys to make sure, but if I remember correctly -that would work. I'm really glad I didn't pay the installer company to setup a system for me. This was really easy. I could probably even make some extra cash setting up these systems for people. This fence a good one I like it for a pitt bull to keep him in my yard. Very good for me. I set this sportdog wire collar fence on for my dog and it work really good. At first I try to get some price from a diffrent company to setup the wire collar for me. But they cost to much and all the friends say I can set up it by myself. I call this company and they dont setup the stuff but they have very good price. Much better. The wire easy to setup and I figure out the collar level to setup and everything work very good. Im glad I call this company flexpet and they help me pick out this wire collar. I can come to them again for something else i need next time. I was surprised to how simple the install was with this system. I was scared to do it by myself so I had my daughter hep me and half way through she left telling me I was good to go it was to simple for her. I did the above ground install and it took almost no time at all to lay it all out and get it up and running. Programming it was easy and it has worked wonderfully for the past week. Wonderful system and I would defiantly recommend! The Sportdog Containment Fence is an awesome system. Two thumbs up. I am impressed at the quality of this containment fence. I had another dog fence from another brand, and this fence does an exceptional job in keeping my two dogs contained. The installation was fairly simple and easy to install. I live on about 2 acres and this fence made life much easier by keeping my two dogs away from the neighbors yard. Two thumbs up. This is a great dog fence system. Do not buy from invisible fence when you have a perfectly good system right here in front of you that you can install and learn all about on your own without their high ticketed prices. Priced out this system for my 10 acre land after my outrageous price from invisible fence. Of course I bought this one! Was a fast shipment and quick installation for literally 1/4th the price I was quoted from the installer. Hands up, I won this one! Simple as that! We are very happy with this system. After countless attempts with other solutions to keep the hounds out of the horse pastures we came across the SportDOG. This looks and feels a lot better well made than the other brands. Everything I've read online said to use better wire so it was nice to find a site that had these kits already put together. Will definitely be coming back for any other pet needs. I am a single mother of three wonderful boys who helped me set this fence system up. Even my 6 year old was able to help me out with it and helped me push in the fence staples to the ground. I am glad the option of an above ground install was available and had the heavy duty wire to go along with it. I priced out other fences and even went to my local stores where it was difficult to even find the systems let alone the cheap versions of them. I also called a company to find out how much an install would be and although they did not want to technically price it all over the phone, it was way to deep for my pocket. When I spoke to the guy at this place, he was very helpful in picking out the system. What I liked was that I could also get a few barriers for inside my house that would work with the collar. I have to say this system was great and easy and the boys helped me train and it worked perfectly. I will be recommending this to a few friends that were interested in finding out how it all works. I do know this system would not work with my friends toy dog, but I will still recommend knowing there are other options for her available. Thank you for having this option available for people like me! SportDOG fence is pretty nice. 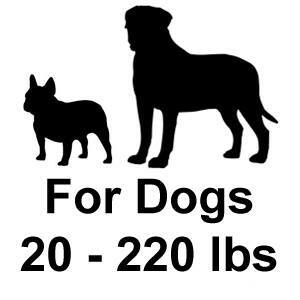 Good system for multiple dogs. I like this SportDOG fence. With the add on little dog collar, I'm able to add a pug to the same system and everyone is happy. The collar that comes with the system works perfectly on a choco lab. Now if I know I am going to get another dog, I won't have any problem adding it as well. The wire is very sturdy. I wasn't about to bury the thinner wire, so this was a good piece of the system. The transmitter seems pretty well made. The collars fit well, the whole thing is easy to setup, and the training wasn't hard at all. I'm overall very happy with my purchase. Sport Dog Pro is an excellent system for covering lots of land. The Flexpetz guy said this system could cover 100 acres of land, but needless to say -there was some skepticism when I heard this. I read the reviews and decided that the SportDOG Pro system is worth a shot. There weren't many alternatives out there, for such a large space. It takes a while, running wire over 73 acres, even with the right equipment. Luckily, there wasn't a need to go back and locate problems. Worked excellently after the first effort. The bigger task was setting up that many flags. Not complaining though. It still cost a fraction of what the installation companies wanted to charge me to set one up. Everything has been perfect since. I would definitely recommend this system to anyone with lots of land. Hello, I ordered this system and I need to tell you how great it has been to work with you. I want to say thank you for all of your help in finding me the right system for my dog's. I did not want to pay to much for a system and this system was less then I thought it would be. The installation of the wire was so easy. The work I do for my company is similar to what I needed to do to install the wire. The hook up was easy to do and the collars work really well. The learning process for my dogs was quick and I have not had any problems since the installation. I really needed this and it works just as I wanted. Your company has great service and has great amount of systems to customize to any needs. I have referred you to my neighbors as well as my son who is looking to order within the next week. I will be over there to help him install his system for his four dogs. I did not think there was a system that would work with my dogs and I am impressed that it actually worked. I talk with mik and he tell me on the sportdog fence for my dobermen. My family live to a farm and we have alot space for the dog to run around. Now he can run alot. Im glad to get help in flexpetz. I could come back to flexpetz and mik and buy other things I could need for me dog. I thanks those guys for ther help. I feel much better to buy from guys who help me know about the parts like that. They take time for me even though I speak langage well. Them do great job. I thank them too.